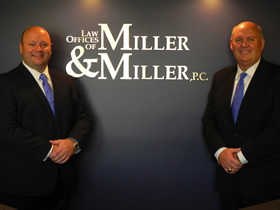 The Law Offices of Miller & Miller, P.C. is a father and son law firm that brings together a vast array of experience and expertise to provide a full range of services in almost every area of legal practice. The firm was established on the principle that legal services ought to be both affordable and of the highest quality. Our clients receive legal counsel and representation at a reasonable cost, by attorneys dedicated to excellence. The Law Offices of Miller & Miller, P.C. has received the prestigious AV® Rating from the Martindale-Hubbell Peer Review Rating system with the highest legal ability and adherence to the highest level of professional ethics. We monitor developments in Congress, the State Legislature, and the courts, to ensure that we are fully aware of new laws and policies, and their impact on our clients. With years of experience practicing law in the state of Michigan and the courts in Wayne, Oakland, and Monroe Counties, the Law Offices of Miller & Miller, P.C. are equipped to handle most of the legal problems that you, your family, and your business may encounter while retaining the flexibility and cost-effectiveness of a small firm. Gordon A. Miller is also admitted to practice in the state of Ohio. Trevor Daniel is also admitted to practice in the state of Florida.